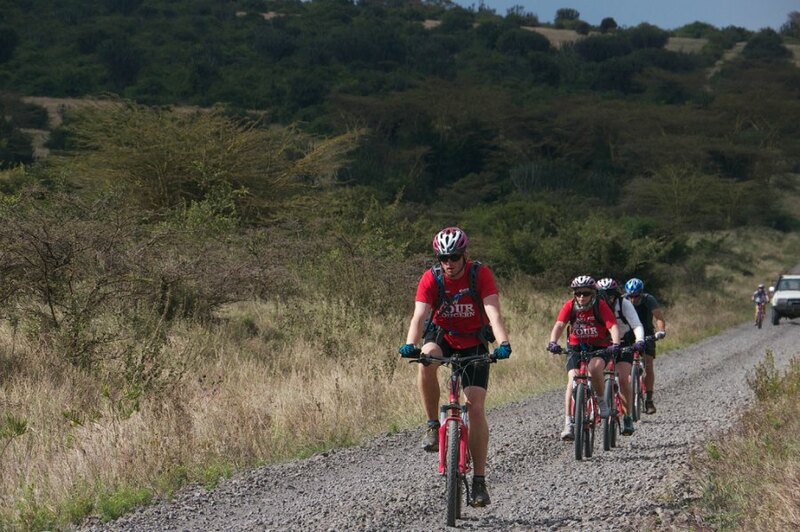 The Kenya Tri Adventure expedition is a challenge of a lifetime covering more than 200km in seven days. 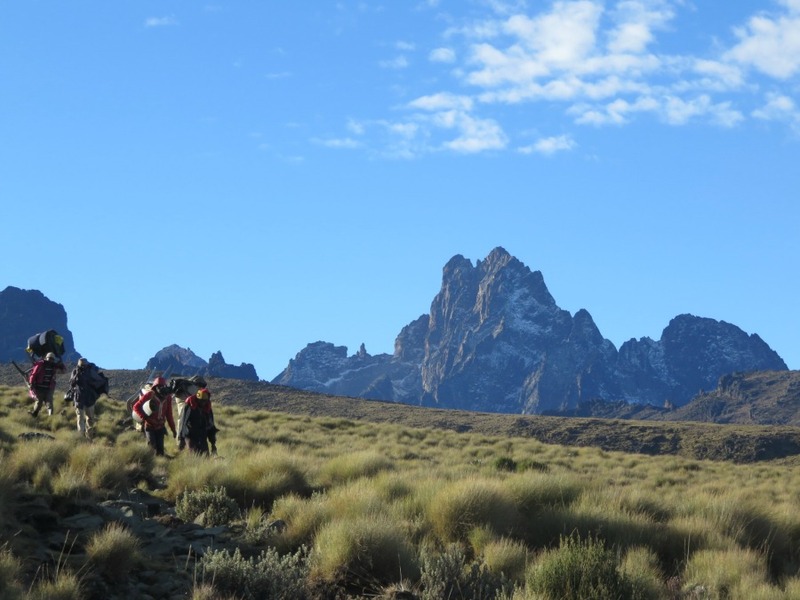 The expedition includes five days of trekking to Mt Kenya (4985m), two days of biking and one day of exhilarating rafting on the Tana River. Each day on the route offers something different and every day is a challenge in its own right. 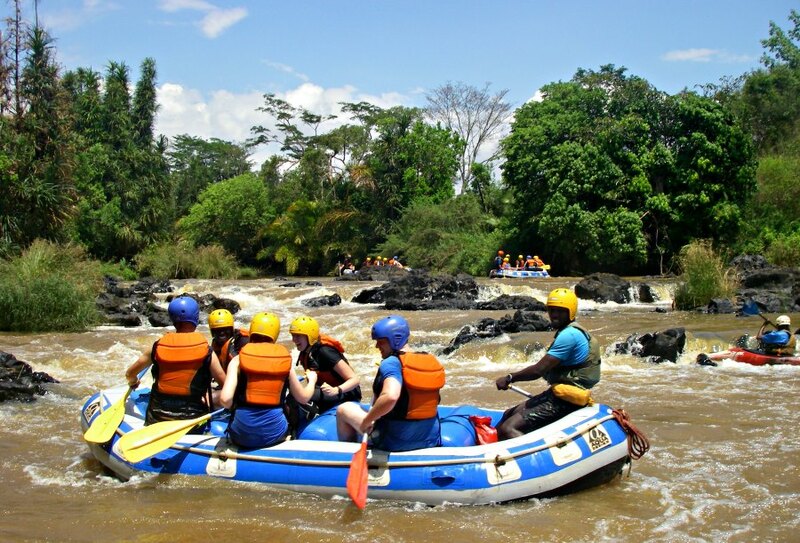 Kenya is most recognised for being home to Africa’s famous “Big Five” (Lion, Elephant, Rhino, Leopard and Buffalo) but most people don’t realise that Kenya also offers some of the best adventure sport in the world. 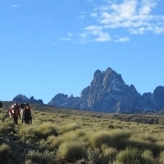 Kenya is a country of tremendous diversity; landscapes vary from glaciated mountains with snow-capped peaks, to dense forest to flat desert plains. Along this journey you will learn about Kenyan culture by chatting with our local guides; Kenyan’s say that ‘You will arrive as a visitor and leave as a friend’! 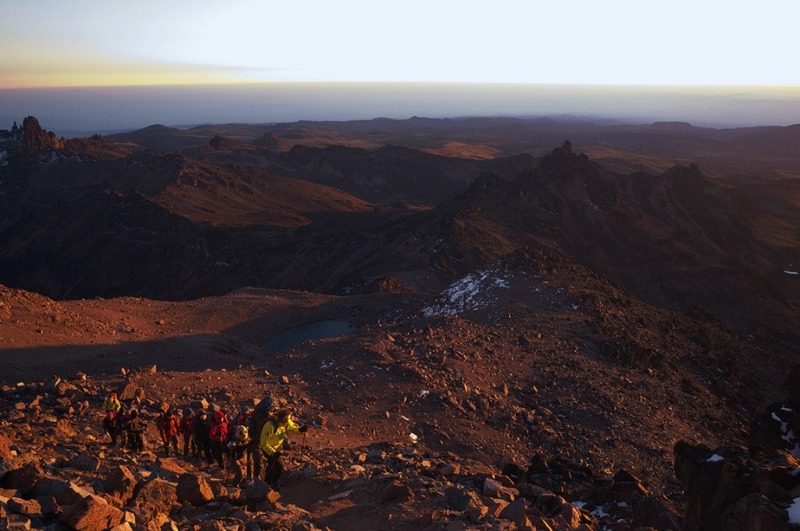 The trekking section of the Kenya Tri-Adventure is a five day hike that takes us to Mount Kenya (4985m) known as Kere Nyaga – Mountain of Brightness. 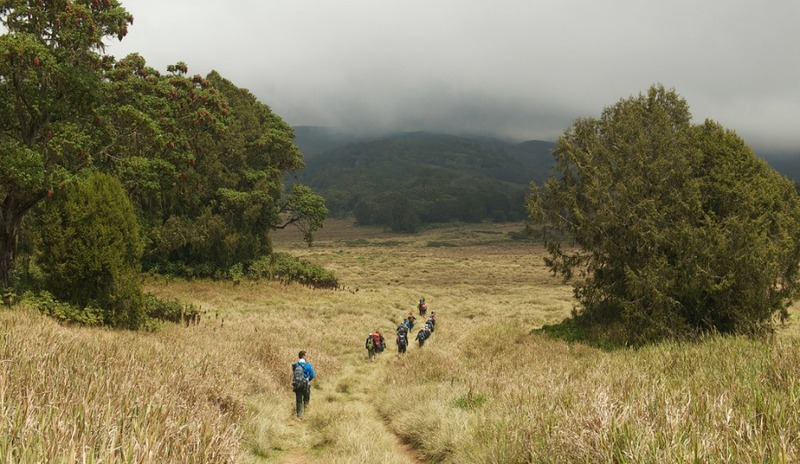 This impressive mountain is an ancient dormant volcano and Africa’s second highest mountain. Long overshadowed by Tanzania’s Mt. 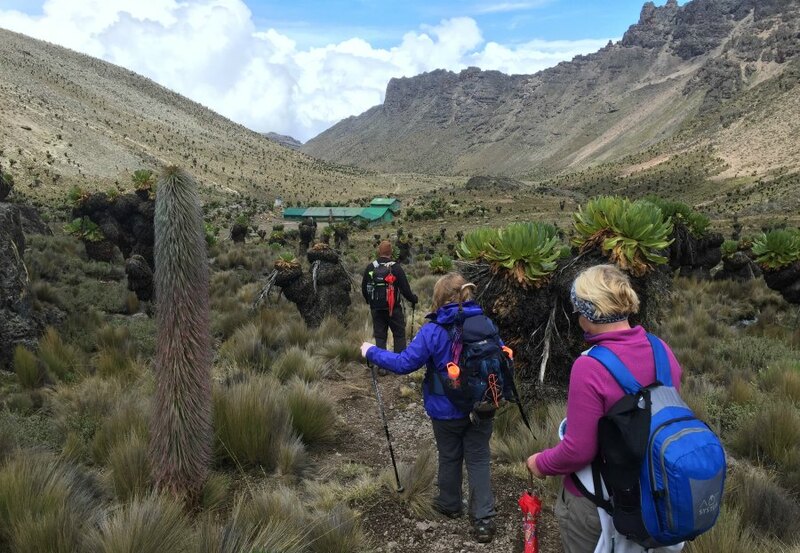 Kilimanjaro, trekkers are starting to take notice of this beautiful glacial peak. The 66km route takes us through a variety of habitat such as dense bamboo and rainforests which are rich in wildlife including elephant, buffalo and monkeys. Even the higher up moorlands are home to many mammals including the diminutive rock hyrax, the nearest living relative of the elephant! 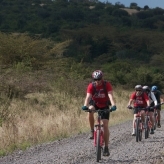 The biking section of the Kenya Tri- Adventure consists of a two day cycle section covering a distance of 106km through the Kenyan countryside. 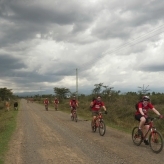 It’s a very scenic route as we ride through rural Kenya with many fun downhill sections as well as tough climbs. For the most part we will be riding on dirt roads with very little traffic. Between the two days of biking we camp in game reserve and go on evening and morning wildlife safaris. 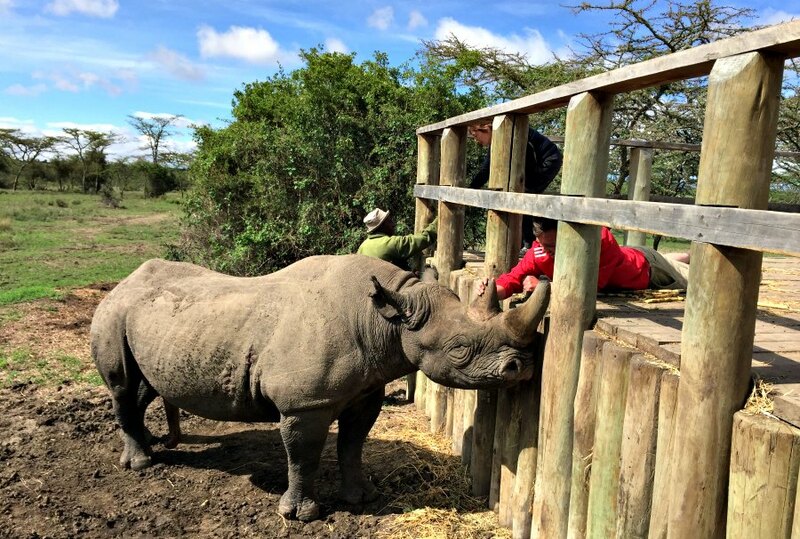 The park is stocked with lion, rhino, elephant, hippo, leopard, giraffe and a whole host of other game. The highlight of this experience is going to sleep listening to some of Africa’s biggest game outside your tent! 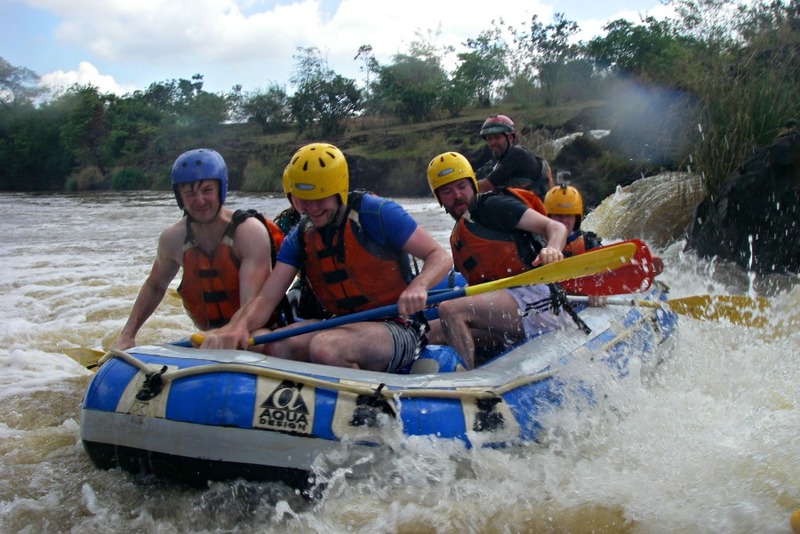 The final section of the Kenya Tri- Adventure is the rafting. This takes place on the Tana River. The river stretches for 1000km and is the longest river in the country. 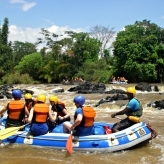 It is a drop pool river so therefore makes for an exciting day of white water rafting. Experienced guides will provide you with the paddle skills you will need to safely get through the many rapids along a 16km stretch. One section of rapids is named the ‘Can of Worms’ because of its four 90 degree bends in succession! The main river is surrounded by stretches of thick forest with fig and palm trees. 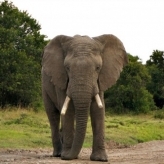 These forests are filled with interesting birdlife and often shelter buffalo, elephant, hippo and crocodile as well as a host of smaller, shyer antelope and primates. 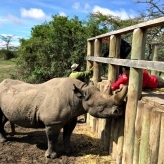 "The Kenya Tri-adventure 2015 was the trip of a lifetime. My first group expedition like this and would recommend to anyone. Between hiking, cycling and rafting you get to experience so much of this beautiful country and people, all in in the expert hands of the Earth’s Edge team. Asante sana!" - Patricia McAfee, Co.Galway. 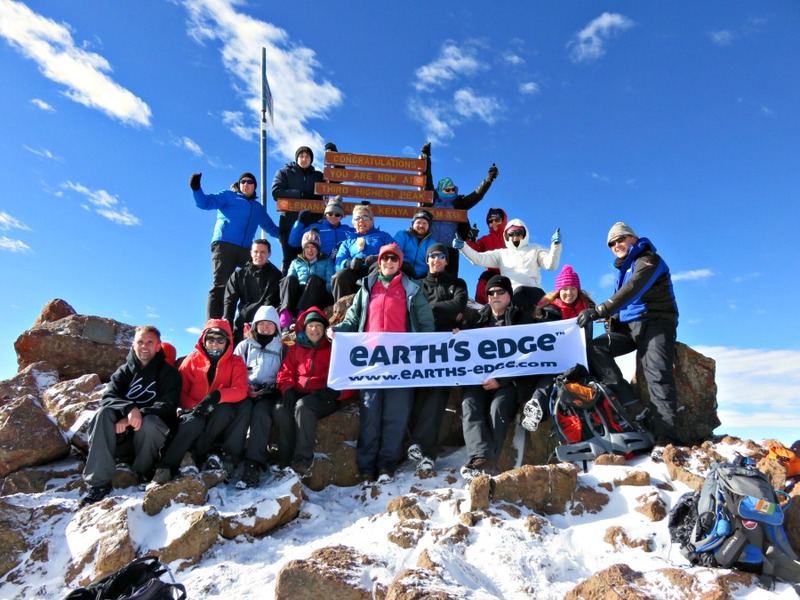 100% Financial Protection – Earth’s Edge is Ireland’s first fully licensed (TA:0711) and financially bonded adventure travel company. 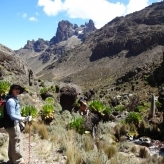 All our Kenya expeditions are led by an experienced Irish guide and doctor who travel with the group from Dublin. 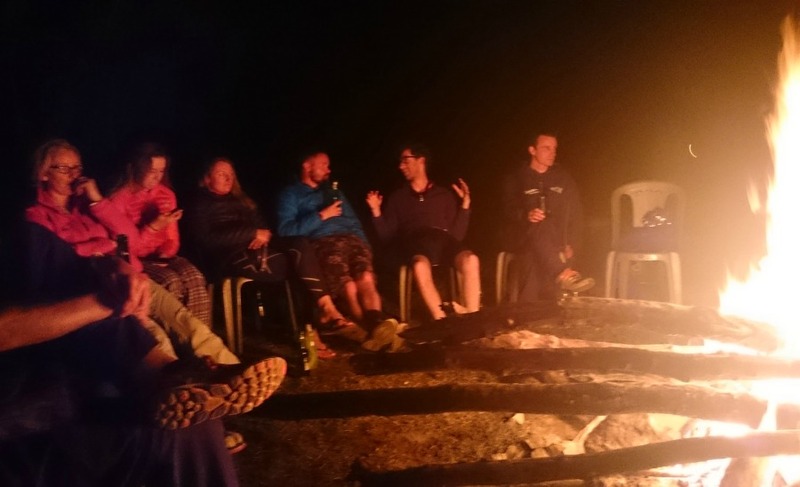 Our packages are inclusive of pre-departure weekend, flights from Dublin, in-country transport, a full local guiding & support team, accommodation, all meals on the trek, trekking permits, a celebratory meal & an Earth's Edge bandana. 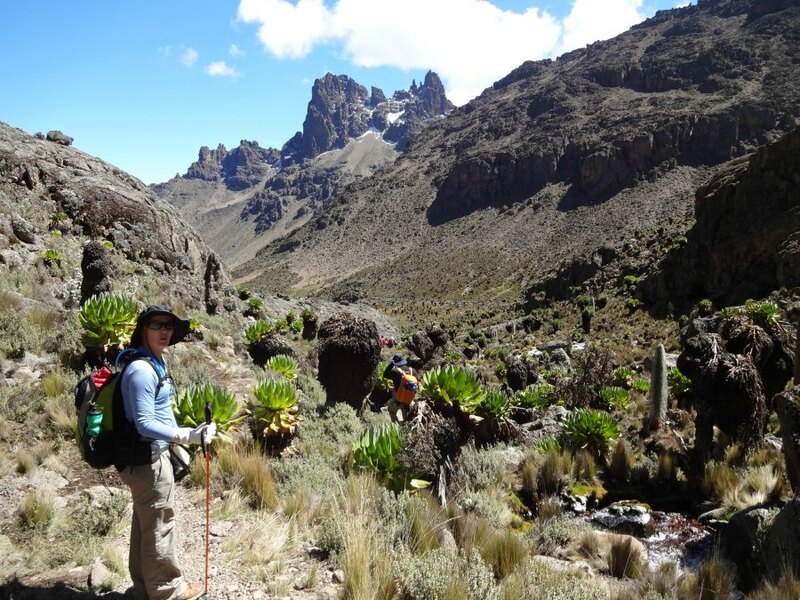 Our 11 day itinerary includes 5 days trekking, 2 days cycling, 1 day on the river and time in Nairobi. We use excellent local guides, cooks and support staff. We have a strict Responsible Travel Policy and ensure our local partners are treated fairly. 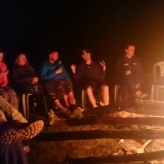 Pre-Departure Weekend– Meet an Earth's Edge expedition leader, an Earth's Edge expedition doctor and your fellow Kenya Tri-Adventure expedition team members two months before departure. Our training weekend consists of a full brief, a hike and a bike ride in Co. Wicklow. We have a strict Leave No Trace policy and do everything we can to ensure we leave the trail as we found it. Depart Dublin in the evening. Overnight flight. Day 2: Arrive in Kenya, 3 hrs driving. Arrive in Nairobi in the mid morning and drive for three hours to the Tana River camp. Relax for the afternoon followed by an expedition brief in the evening. Overnight camp. 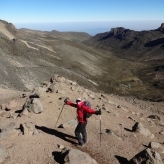 Day 3: Chogoria (1600m) to Chogoria Gate Camp (2950m), 5 hrs trekking / 14km. In the early morning we drive to Chogoria and then trek for five hours to reach the park - gate which will be our first campsite. Overnight camp. 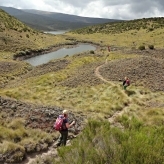 Day 4: Chogoria Gate Camp to Lake Ellis (3500), 8 hrs trekking / 14km. Today’s route sees us emerge from the rainforest and pass through the bamboo zone to reach our campsite at Lake Ellis. Overnight camp. Day 5: Lake Ellis to Mintos Hut (4200m), 7 hrs trekking / 8km. Enjoy stunning views on the trek to the Mintos hut. We enjoy a relaxed afternoon in preparation for tomorrow’s summit day. Overnight camp. Day 6: Summit Day! 12 hrs trekking, 4km to summit 18km to Old Moses Camp. 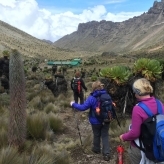 Trek from Mintos to Lenana (4,985m) and then down to Shiptons camp for a rest before continuing to Old Moses camp for the night. Overnight camp. 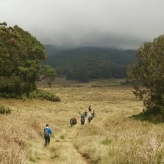 Day 7: Old Moses Camp to Ol Pejeta Conservancy, 2 hrs trekking & 6 hrs biking / 50km. 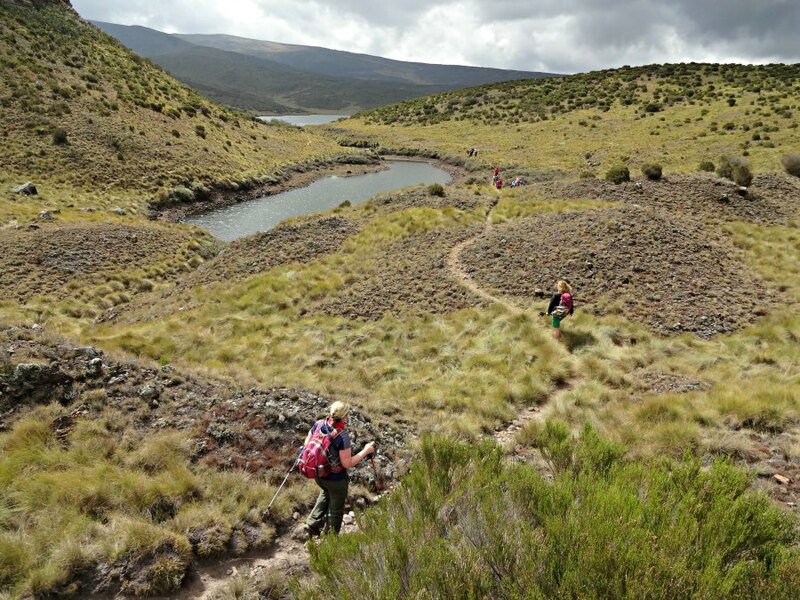 We start by walking for two hours to reach the end of the trekking route. 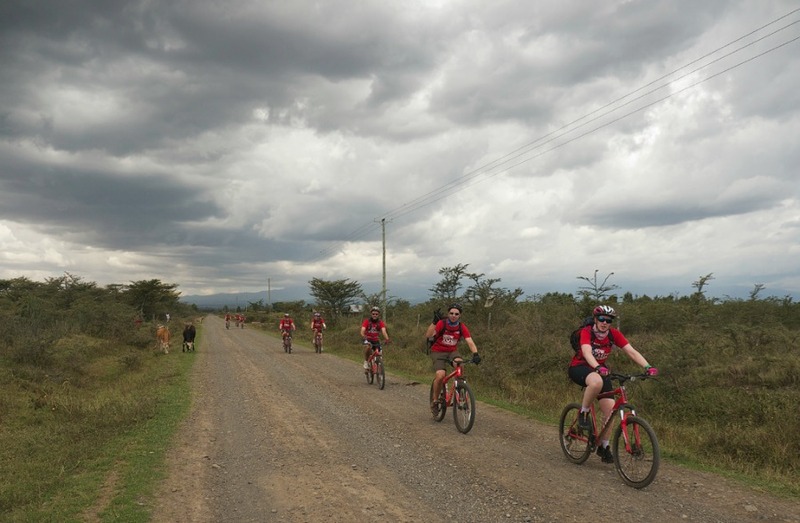 Our first day on the bikes is mostly downhill as we descend our wild camp in Ol Pejeta Conservancy. Enjoy a game drive in the evening. Our campsite is located inside the game reserve so we go to bed listening to some of Africa’s biggest game just outside your tent! Overnight camp. Day 8: Ol Pejeta Conservancy to the Tana River, 6 hrs biking / 56km. After an early morning game drive we cycle for 56km to where we meet the main road, from here we finish the last 40km by bus. Overnight camp. 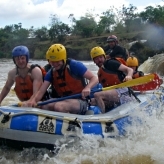 Day 9: Tana River, 4 hrs rafting. We start with some easier rapids and then finish with some exciting class IV drops. Celebration meal in the evening. Overnight camp. Day 10: Tana River to Nairobi. We enjoy a relaxed morning, after lunch we drive to the airport in Nairobi in time for our evening flight back to Dublin. Overnight flight. Arriving back to Dublin in the early morning. Expedition ends. €399 deposit at the time of booking & a €3,100 balance payment two months prior to departure – Total €3,499. Read our best price guarantee. *If you would like to book this expedition excluding international flights, please contact us for a land only price. 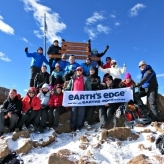 Costs include international flights to Kenya, an expedition leader & doctor travelling with the group from Dublin, all transport in Kenya, all meals on the expedition, all group gear including bikes, two safari game drives, all accommodation based on twin sharing in lodges & camping, local support team and an Earth’s Edge trekking bandanna. *Prices were set on September 26th, 2018. Mount Kenya is the highest mountain in Kenya and the second highest in Africa, after Mount Kilimanjaro in Tanzania. 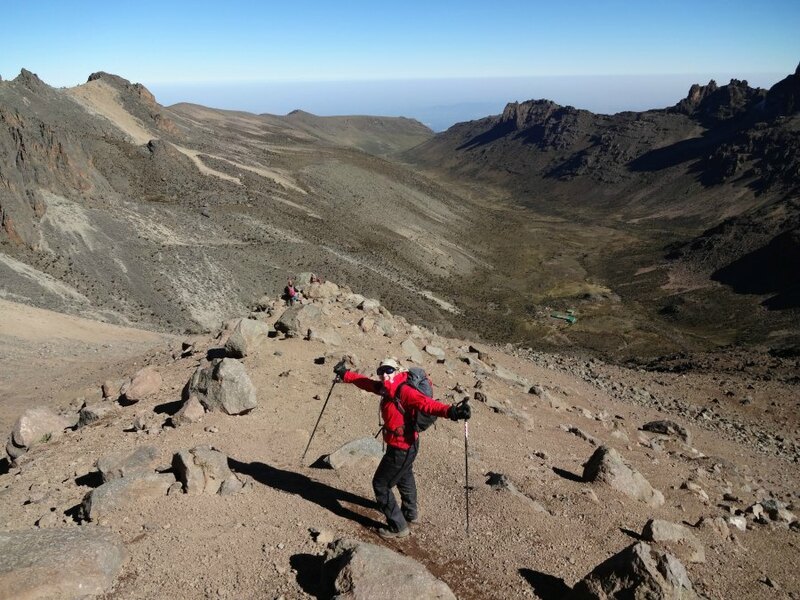 The mountain actually has three peaks which include; Nelion (5188m) and Batian (5199m), but the third peak – Point Lenana (4985m) is the only one accessible to trekkers. 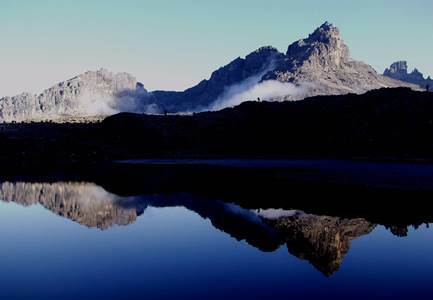 Mount Kenya is a volcano, about 3 million years old, whose base diameter is about 120km. The last eruption was over 2 million years ago. The country actually takes its name from Mount Kenya and not the other way round! Kenya is located in East Africa and because of its location on the equator, the sun rises and sets at almost exactly the same time each day, 5:30 am and 5:30 pm. In 2014, the population of Kenya was estimated to be around 45 million. The capital and largest city is Nairobi. Mombasa is the second largest city. The two official languages in Kenya are English and Swahili, although there are dozens of other languages spoken in various parts of the country. Kenya gained independence from the United Kingdom in 1963. Kenya shares Lake Victoria, the world's second largest fresh water lake, with Tanzania and Uganda. After coffee, Kenya’s biggest income generator is tourism. For the Kenyans, however, coffee is considered an export product, not something for local consumption. The local favourites are tea and beer. The mountain is home to several unique species of animals, including the Sykes Monkey, Cape Buffalo and Bongo Antelope. 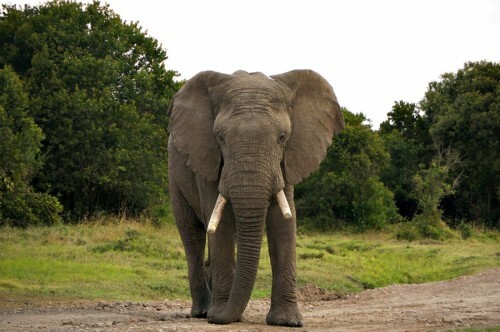 Large animals such as lions, buffalo, leopards, elephants and rhinoceros are present in Kenya. About 340 species of birds can be seen here. Kenya features many national parks and wildlife reserves, with safaris being a popular activity for visitors. Four different ethnic tribes live around the mountain. The Gikuyu tribe build their huts with doorways facing the mountain, as they believe it to be God’s throne on Earth. 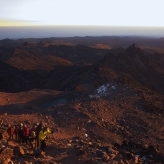 The first recorded ascent of Mount Kenya was in 1899. Some of the oldest known paleontological records of man’s history have been found in Kenya. No, I am doing this trek for myself. If yes which charity are you fundraising for? Click here to read the expedition itinerary. Click here to read the Earth's Edge bookings conditions. When you click submit you will be brought to a secure page to pay your €399 deposit. If you would like to sign up to this expedition but need some time before you can confirm your commitment, we can hold a space for you. We will hold your space for 48 hours after which time you will need to complete the booking form & pay your deposit.